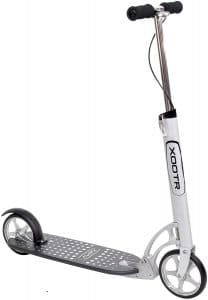 As an adult, it can be exceedingly tough to find a decent kick scooter. This is because the vast majority of the kick scooters on the market are built for kids. Riding one of these around as an adult is not going to be fun by any stretch of the imagination. Most are not constructed to support that sort of weight. When we were putting together this list of the ten best adult kick scooters, we had to think hard about what people wanted in a scooter. We know people want something that is going to last a while, but we also know that they do not want to pay through the nose for their scooter. This means that while many of the scooters on this list are going to be slightly more expensive than your typical children’s scooter, they aren’t going to be restrictively expensive. We deliberately avoided those, because rarely do they deliver value for money when they are a simple kick scooter. If you are looking to spend hundreds of dollars, then you may as well opt for an electric scooter. Let’s start off with a comparison table. We have highllighted bestsellers in green and the best choice in our opinion in red. For those who are doing a lot of jumping on and off their scooter, perhaps to hop onto public transport, then this offering from Hudora may be perfect. It weighs just 8.8lbs, and it is quick and very easy to fold up, which means that you should have absolutely no issues carrying it around. The wheels on this scooter are 8.1’ in diameter, which means that they offer an incredible amount of stability. They are designed to be hard-wearing too, which means these wheels should last an incredible amount of time, even if you are using your Hudora 205 on a daily basis. The size of the wheels will also ensure that this scooter is even faster and even more agile than many of the other comparable kick scooters on the market. It is a true comfort to ride. The handles are wrapped in the softest sponge possible, which means that you should not feel any pain in your hands, even when you are riding over the bumpiest of terrain. This stability is retained, even when you are hitting the maximum rated weight of 220lbs. These scooters are as rare as hen’s teeth, and there are very few retailers that stock them. This is a shame, because they are without a doubt some of the best scooters on the market. One of the interesting things about these scooters is that they are all handmade in Pennsylvania. It is not really reflected in the cost, though. 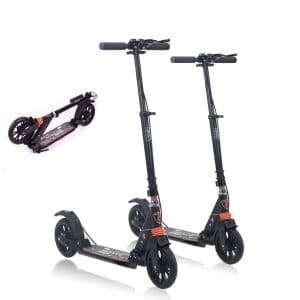 Yeah, they are a little bit more expensive than other adult kick scooters on the market, but not so high that you wouldn’t be able to afford one. The brilliant thing is that since these are all produced in the United States, you are never more than a phone call away with getting help with your scooter. It is surprising just how much this scooter is able to cope with too. It can deal with people up to a height of about seven feet, and there is enough space on the scooter to rest both feet comfortably. 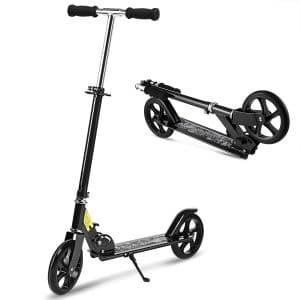 This is rare for kick scooters, with most of them requiring people with larger feet to move them about in an uncomfortable position to actually ride it properly. Not an issue with this scooter. Whether you are riding it for hours or minutes, the ride is always going to be the same. This scooter is actually the only one produced by the company that makes it. This is because the company in Pennsylvania actually designs race cars. The Xootr was more of an experiment for them. This means that you will find a lot of the technology that has been designed for cars actually built into this scooter. This gives it an incredibly smooth riding action and even better steering action. It looks tremendous too. Nice and sleek, even when you have folded it up (which takes no more than a couple of seconds). If you want a sweet kick scooter ride, then this should be right at the top of your list. This is actually going to be the cheapest adult kick scooter on this list, but that certainly does not mean that it is a bad scooter, not by any stretch of the imagination. 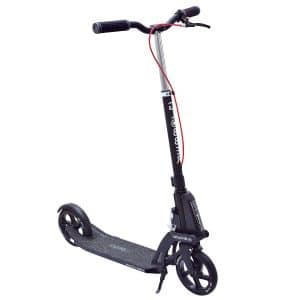 This is also one of the only adult kick scooters on this list which does not require assembly from anybody. Just pull it out of the box and you are good to go. This scooter is made from aircraft-grade aluminum which means that it is incredibly lightweight, but it also means that it has been built to last. 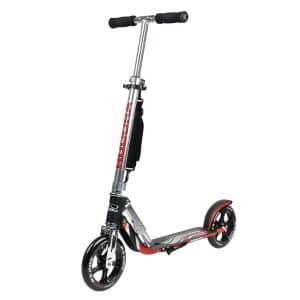 While generally not recommended, you could easily give this scooter a good few knocks and it is going to come out virtually untainted at the end. This scooter has been built for the taller person. You have a lot of height adjustment in the handlebars, which does make it comfortable to ride. The larger wheels also provide a great deal of stability for the ‘weightier’ person out there. 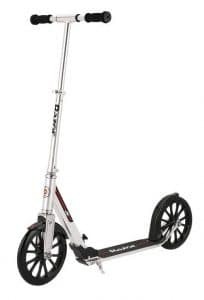 One of the things I personally loved about this kick scooter is how effective the brakes actually are. The large wheels will get you up to speed quite quickly, but if you need to slow down quickly, then you have a top-notch braking system on the back which will assist you perfectly. This Monodeal scooter is able to support a whopping 180lbs of weight. The handlebar has so much adjustment in it, that it can actually be used by anybody from young kids up to adults. One of the key highlights of this scooter, and the reason why we are including it on this list, is the fact that the shock absorbers are second to none. You can go over the bumpiest of terrain, and you will hardly be able to feel a thing. Even the wheels have quality bearings built into them which help to ensure the smoothest possible ride. The handlebars of the scooter come with a firm grip, which means that as you are travelling over the bumpy terrain, you are not going to feel anything in the weight of vibrations. One of the most useful features is the double braking system. Many people have been zipping around on a kick scooter only to find that they need to slow down quickly. Often, it can be quite a convoluted process to hit the back brake quickly, particularly if you are not using a good riding technique. This is not going to be an issue with this kick scooter. Not only do you have your standard brake on the back wheel, but there is also a brake built into the handlebar, which allows even greater control over this adult kick scooter. There should be enough space on the deck to provide you with ample space for your feet, no matter how large they are. This is easily one of the most comfortable scooters on the market to ride, and you will not be disappointed with your experience. As you can probably tell, this scooter has been built specifically for sitting riding, and just about every single part of this scooter makes this as simple as possible. Let’s be honest, the bulk of cities have not really looked after their sidewalks. You will see tons of cracks and the like of them. The Fuzion CityGlide has been designed to overcome this. It has larger wheels, so you can go over huge cracks in the sidewalk (because your local government hasn’t repaired them!) and you should be 100% fine. The scooter is highly portable. Sure, it is probably not going to slide in your backpack or anything like that, but the designers have realized this. You can fold up the scooter in mere seconds, pull out the strap that is attached to the scooter and put it over your shoulder. Even though the wheels on this scooter are a little bit larger than you may be used to (7.9”), the scooter still feels surprisingly comfortable on your shoulder. Riding this is fantastic too. The handlebars will accommodate anybody up to around 6 feet in size. It is even able to support up to 220lbs of weight, which means that most people should be able to ride this with ease. 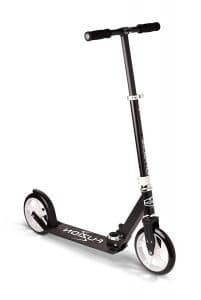 Even the weightiest people riding this will still find that the scooter is able to glide across the floor at great speed, which means that the scooter is perfect for your daily commute no matter who you are. Only real downside to this scooter is the fact it takes a little bit of setting up right out of the box. But, even then, it is just tightening up a couple of screws and you will be ready to hit the streets of wherever you live. Globber is a really well-known brand with a reputation for good quality in the world of scooters. Their Adult One model is no exception when it comes to their standards. You don’t have to worry about riding on rough terrains as Globber Adult One features big 7 inch wheels that are made of high rebound and high quality polyurethane. They are really good for bumpy rides and if your neighbourhood “boasts” with these circumstances, then Globber Adult One is definitely the way to go. This model also features rear brakes that are connected to the handle bar with a pull lever, so you can feel really safe as you control the scooter from the handle bars. It also features a mudguard that in muddy or wet conditions protects you and the scooter itself from splashes, but can also be used as a break if you press it with your foot. The sturdy structure carries up to 220lbs of weight which should be more than enough for a standard adult rider. The scooter itself weighs 11.8lbs and is foldable, hence really easy to carry around when you want to catch a bus to go a bit further from home. The scooter is also perfect for taller riders as the handlebars are adjustable to all sizes of riders. Furthermore, the handlebars are also really comfortable because of the curvy shape and length, not to mention the dual-injection material. There are a lot of features built into this Hikole Scooter which are there to ensure that you get the smoothest possible ride while you are travelling about. For starters, the wheels on this scooter are huge. You have a whole 8’’ of goodness with them. This means that small cracks in the sidewalk are not going to pose a problem for your kick scooter. You will just sail right over them. They are not going to be ideal for going off road with your scooter, but most people are not going to be doing that anyway. In addition to this, the bearings on the wheels have been designed to reduce vibrations. Furthermore, there is a dual suspension system in place. Unless the floor is incredibly bumpy, which you are not going to be encountering in the areas for which this scooter is built, then you aren’t going to feel a thing. The brakes on this scooter are built into the rear wheel. While you do not have access to brakes on the handle like some scooters on the marker, the rear wheel brake has been designed to work almost instantly and you can slow down quickly. It is easy to reach too, and rust free which means that you don’t have to worry about the scooter failing. The one issue with the scooter is that it is not designed for the tallest people out there. If you are over six feet, then you are probably going to have a few issues trying to reach the handle of this scooter. However, it does support up to 220lbs in weight. This is the second kick scooter to appear on this list from Hudora, but let’s be honest, you can’t beat a good bit of German engineering. Since this scooter comes from a German car manufacturer, then you can expect it to be good too. 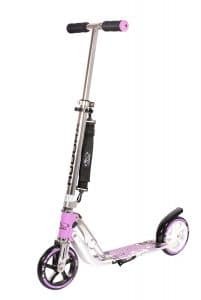 To be honest, this scooter is not that much different from the previous Hudora on this list, although it does have a slightly different ‘look’ to it. It can also be folded up a little bit smaller, which means that it is more ideal for those people who are going to be commuting a lot and want something that they can fold away. This can easily slide under your desk at work without any issues. One area where it is majorly different from the previous Hudora is its weight. It weighs only 6.6lbs, but it is still able to support weights of up to 220lbs. This is a huge amount. The adjustable handlebars means that it should be able to deal with most heights of people too, although the slightly smaller size of this scooter may mean that some people struggle with it. The PU wheels on this scooter come in at 7 inches in diameter and they have a high level of resistance, which means that these are going to last you for years. They are even able to put up with pits in the road without any wearing off. The handles are great to hold too. It is only a small amount of sponge on the handle, but the amount of grip you get when you are using this scooter is immense. Unlike most other adult kick scooters, you won’t have to worry about the sponge chipping away either. It is awesome to ride. This is the second Razor scooter found on this list. Since the Razor A5 was such a brilliant scooter in itself, there is actually very few differences between the previous model and this one. 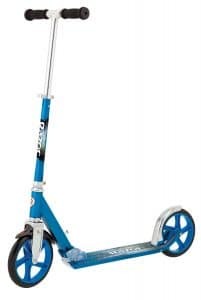 The only real change is that this scooter has slightly larger wheels, coming in at 10 inches. The benefits of having slightly larger wheels is that it means you are going to have a lot more stability when you are riding the scooter. However, this is going to come at the expense of handling. So, if you are after a decent scooter which is able to traverse most terrain, even if your local government has been a bit stingy with filling in pot holes, then this scooter is going to be right up your street. If you are more the type of person who wants to traverse through areas with lots of twists and turns, then the A5 is probably going to be more your scene. One area where the A6 does have a bit more going for it than the A5 comes in the form of anti-rattle handlebars. However, to be honest, the A5 is so well-designed that there is barely any rattle in the handlebars anyway. However, if you do have problems with hand pain or something similar to that, then the A6 is probably going to be more your ‘thing’. The handlebars have been designed to be extra-long, and can extend up to 42”. This means that unless you are a Guinness World Record holder for ‘tallest person’ in the world, then this scooter is probably going to be fine for you. Don’t worry about this scooter breaking down on you any time soon either. This is a scooter which has been basically built for life. Sure, the wheels are likely going to wear down eventually (they always do so on scooters), you are probably still going to get thousands of miles from them, plus they are replaceable anyway. We are going to wrap up this list with a scooter which is a little bit different, because we know that not everybody is looking for a scooter for commuting to work. This is actually a ‘stunt scooter’. 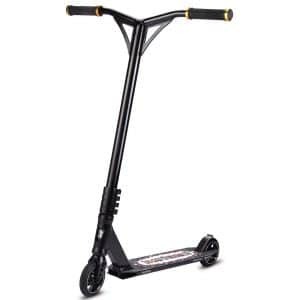 It is actually one of the cheapest stunt scooters on the market. There are small wheels on this scooter, which means that while you could possibly use it for commuting, it probably wouldn’t do too well long term as it means the scooter is going to lack a little bit of stability. These wheels have been designed specifically for agility, which means that you will be able to perform all sorts of weird and wonderful tricks with the scooter. Unlike the other scooters on this list, this scooter has a V handle bar rather than the T shape. This also helps with moving about, although it is not particularly ideal for ensuring perfect stability. It is also a lightweight scooter, which is going to make carrying your Outon freestyle stunt scooter around an absolute breeze. However, you should be aware that this scooter is not really built for portability. You aren’t going to be able to fold it up, so if you are looking for a scooter to take on your commute to and from work, then this is probably not it. This is probably the cheapest stunt scooter on the market to actually be viable for learning tricks on. It can hold up to 300lbs too, which means you can put a lot of pressure on it while you are playing about and doing whatever tricks you want.